Robin, Chrissie and Jo share a flat which they rent from ever-arguing husband and wife George and Mildred Roper. When they hear that property developer Spiros has plans to buy the whole block where they live and demolish it, Robin and the girls set up a neighbourhood action committee to stop him. They know that they can count on the support of Mildred, but George is a different matter – he’d rather take the money and run! 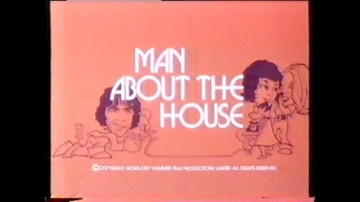 Another television spin-off, this time again from a Thames TV sitcom. Richard O’Sullivan has been an actor since childhood. His films include the epic “Cleopatra” (1963), in which he played the queen’s young brother, King Ptolemy. Arthur Lowe had been around for many years and can be seen in a tiny role as a reporter right at the end of the classic Ealing comedy “Kind Hearts and Coronets” (1949). His first famous part, though, was in the sixties when he played Leonard Swindley in Granada TV’s “Coronation Street”, followed by the part for which he will always be remembered, as Captain Mainwaring in BBC TV’s immortal “Dad’s Army”. His films include “Theatre of Blood” (1973, with Vincent Price) and Hammer’s “The Lady Vanishes” (1979). Speaking of “Dad’s Army”, Bill Pertwee, who played Air Raid Warden Hodges in the series, appears in this film as a postman. And speaking of “Coronation Street”, Johnnie Briggs, who plays Mike Baldwinin the programme, plays a milkman in this film.